22 July 2016. A spin-off enterprise from Indiana University is creating a device to measure sympathetic nerve activity — the fight-or-flight response — in people with heart rhythm disorders. Research and development of a prototype device, by Arrhythmotech LLC in Indianapolis, is funded by a new 2-year, $1.47 million grant from National Institute of Drug Abuse, a part of National Institutes of Health. The device, known as neuECG, is a non-invasive technology to record sympathetic nerve activity and electrocardiogram measures with electrodes placed on the skin. The sympathetic nervous system responds to threats releasing neurotransmitter chemicals into muscle fibers, which can also affect heart muscles, resulting in atrial fibrillation, a condition marked by irregular heart rhythms. While some current techniques can measure sympathetic nerve activity, says Arrhythmotech, they provide only indirect readings or require invasive placement of sensors. 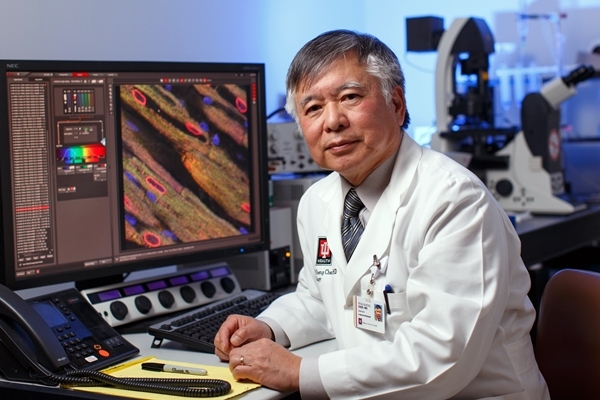 The research behind neuECG was done in the lab of Peng-Sheng Chen, director of Indiana’s cardiology institute. The lab’s research with animals shows an early version of the device with electrodes on or under the skin records sympathetic nerve activity that correlates closely with sensors on the stellate ganglion, a collection of sympathetic nerves in the throat. The university filed a patent application for the device. Chen, with Indiana cardiology colleague Shien-Fong Lin, founded Arrhythmotech in 2014 to commercialize the technology. The company received a Small Business Technology Transfer or STTR award to establish the feasibility of the neuECG device in humans. The new funding will enable Arrhythmotech, directed by Thomas Everett, another Indiana cardiologist and the company’s chief scientist, to develop working prototypes of the technology for human clinical trials. Under the new award, the company will validate an neuECG prototype in a clinical study at Cedars-Sinai Medical Center in Los Angeles. Arrhythmotec plans to test the device as well in research at the Mayo Clinic with lidocaine injections into or removal of the stellate ganglia to control sympathetic nerve activity. Lidocaine is a local anesthetic also given to control irregular heart rhythms. In addition, the company expects to test the feasibility of sympathetic nerve activity as a biomarker of vulnerability for atrial fibrillation. Chen and colleagues formed Arrhythmotec as part of the university’s SpinUp program encouraging scientists to become entrepreneurs. In 2015, the company was one of the finalists in the annual BioCrossroads New Venture Competition, a statewide contest among start-up life sciences enterprises.